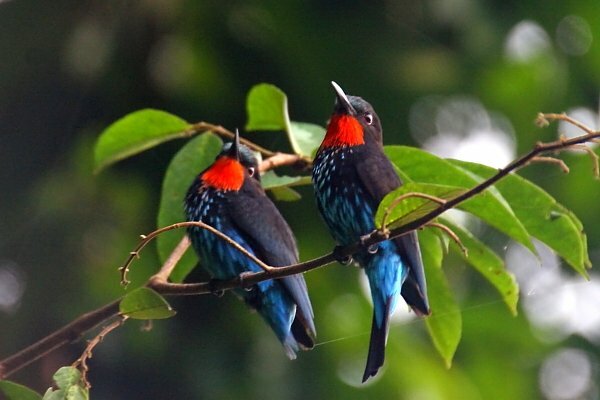 The wonderful family Meropidae contains 27 dazzling species, of which Africa is endowed with no less than 20 species, the balance occurring across Asia and with one as far afield as Australia. These charismatic, colorful and finely formed birds are favorites amongst birders from experts to novices, and lie within the group of birds whose beauty even non-birders really appreciate. In Africa, our bee-eaters occur from the southern tip of the continent right through to the far north, occupying an incredible range of habitats and niches, from the interior of the deepest rainforests of the Congo to the arid steppes of the Sahel. 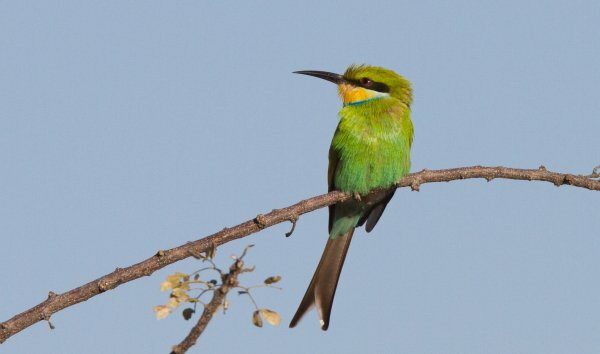 We have both resident and migratory species, and this post will briefly discuss each of the 20 species of African bee-eaters. Besides being colorful and energetic, another plus of these lovely birds is that they are relatively easy to track down. I have been fortunate enough to have observed all 20 species in Africa, and it is not beyond the means of any birder who makes several visits to Africa to achieve the same goal. My personal record is 8 species in a morning along the Nile in Uganda’s Murchison Falls National Park. Arguably Africa’s most decadent bee-eaters, they used to be considered a single species but are now split, the principal physical difference being the green versus red throat of the Northern form. 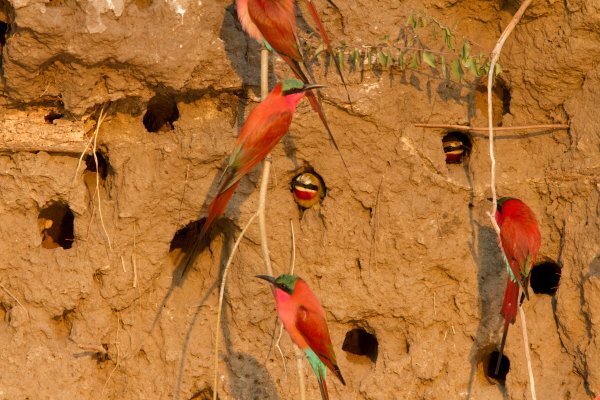 These bee-eaters nest in colonies, usually in holes in the steep banks of rivers. These colonies can consist of thousands of individuals (over 10,000 birds at some colonies!) forming one of the world’s greatest bird spectacles. Nothing is quite as exciting as seeing hundreds of these brilliant crimson birds filling a tree like Christmas ornaments or taking off in a massive, coordinated flock of hundreds of red arrows, all emitting their cheerful throaty calls. They forage over grasslands and Acacia savanna, and are well known for the ingenious use of ‘beaters’ to chase up grasshoppers, dragonflies and other prey species. These beaters usually take the form of grazing herds of game and domestic animals, and large flocks of carmine bee-eaters may gather overhead. They also use various creatures as convenient mobile perches from which to swoop off, snatching insects flushed by their ride. 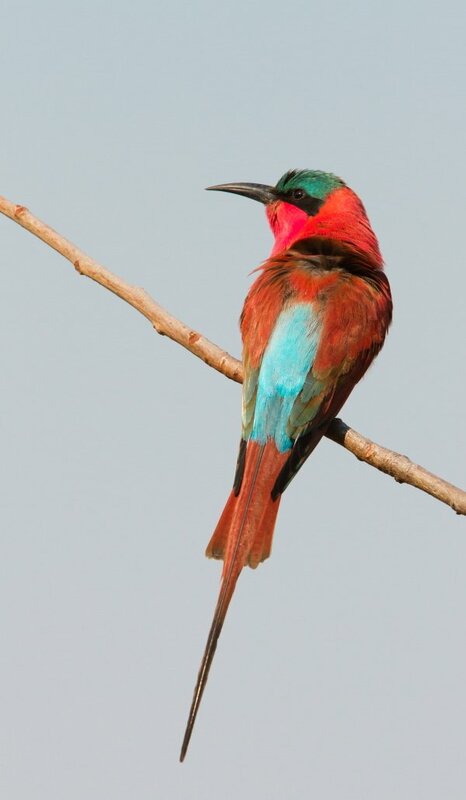 Northern Carmine Bee-eaters in particular are masters of this trait, and rides range from elephants, donkeys and goats to Kori and Arabian Bustards, Abyssinian Ground Hornbills and a variety of other larger birds and mammals. Carmine bee-eaters occur throughout most of Subsaharan Africa, and many populations migrate widely post breeding. Excellent places for finding Southern Carmines include Shakawe in the panhandle of Botswana’s Okavango Swamps and along the Zambezi in Namibia’s Caprivi Strip (a particularly large colony exists near Kalizo Lodge). The Northern Carmine is readily seen in Ghana’s Mole National Park, Ethiopia’s Rift Valley and in Uganda’s Murchison Falls National Park. 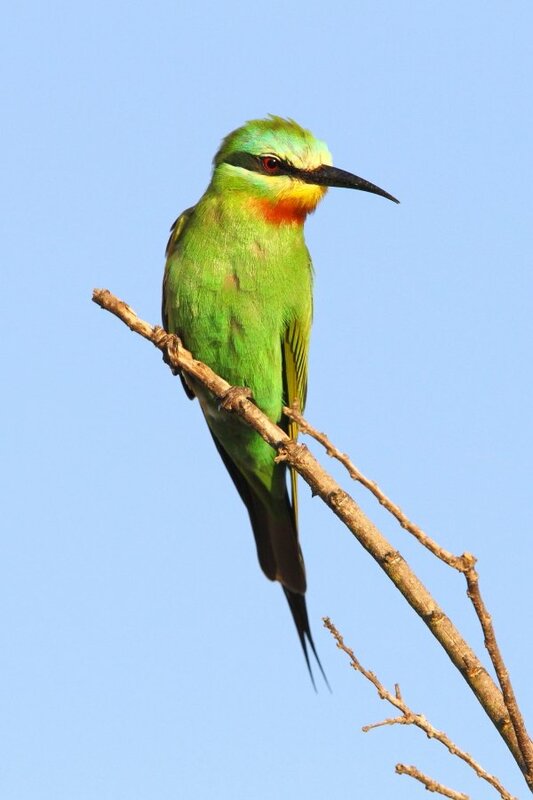 This beauty is one of the world’s lesser known bee-eaters, due to its range being restricted to infrequently visited parts of Central and West Africa. 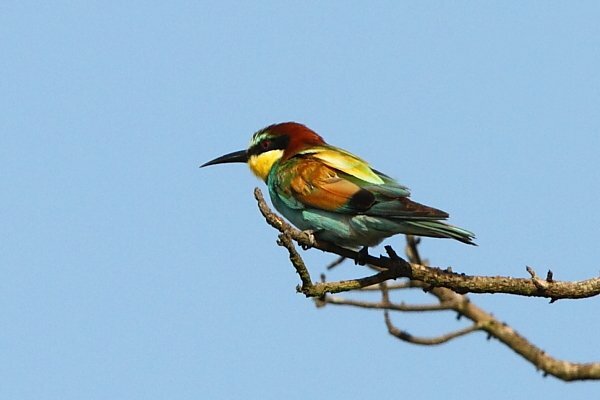 These bee-eaters also breed in fantastically sized colonies (some estimated to number over 50,000 birds) along rivers, but instead of choosing steep, sandy banks, Rosy Bee-eaters excavate their nest holes on wide, sandy, flat river islands and banks (in Gabon they nest in association with the mythical African River Martins, forming even more massive bird colonies!). After breeding they also disperse over the rainforests and savannas of West and Central Africa, where they hunt for aerial insects. 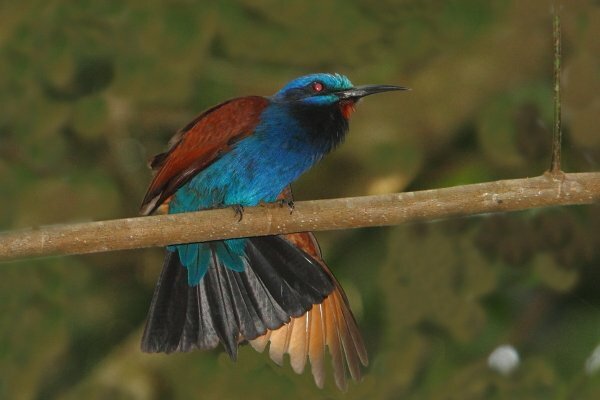 The best locations for finding this beautiful bird is over Kakum National Park in Ghana (non-breeding) and Loango National Park in Gabon for breeding birds. 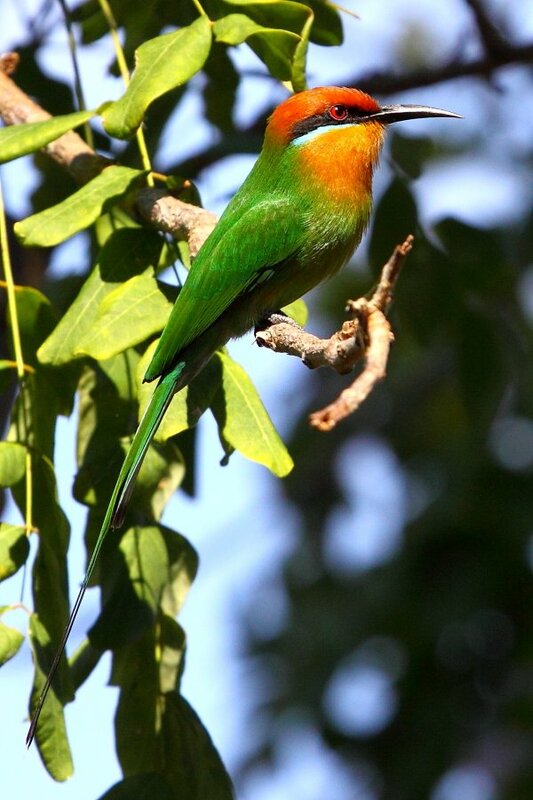 This beautiful bee-eater is also one of the species that has been seen by very few birders, occupying an even narrower West and Central African range than the previous species. Furthermore, they are far more secretive, quietly perching on forest edges (where their predominantly green plumage makes them tough to spot), usually solitarily or in small family groups and inconspicuously making short sallies to catch bees and other prey. The most reliable and accessible site for this bird is also Loango National Park in Gabon. Another pair of species that until very recently were considered conspecific, these ravishingly beautiful bee-eaters are also inconspicuous forest dwellers, most often found in mid-levels of the interior of tropical rainforests where their dark coloration makes them very tough spots. The former occurs from Kakamega Forest in Kenya westwards to Cameroon and the latter from Cameroon westwards to Sierra Leone. The most obvious differences are the short tail streamers of Blue-moustached and the paler forehead of Blue-headed. 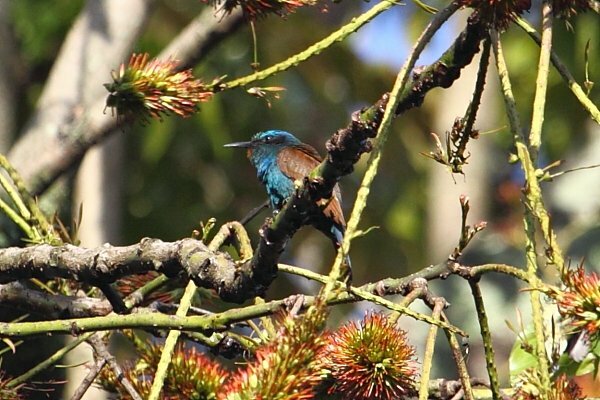 The best places to see these birds are the aforementioned Kakamega Forest for Blue-headed, and Ghana’s Atewa Forest or Cameroon’s Korup National Park for Blue-moustached. 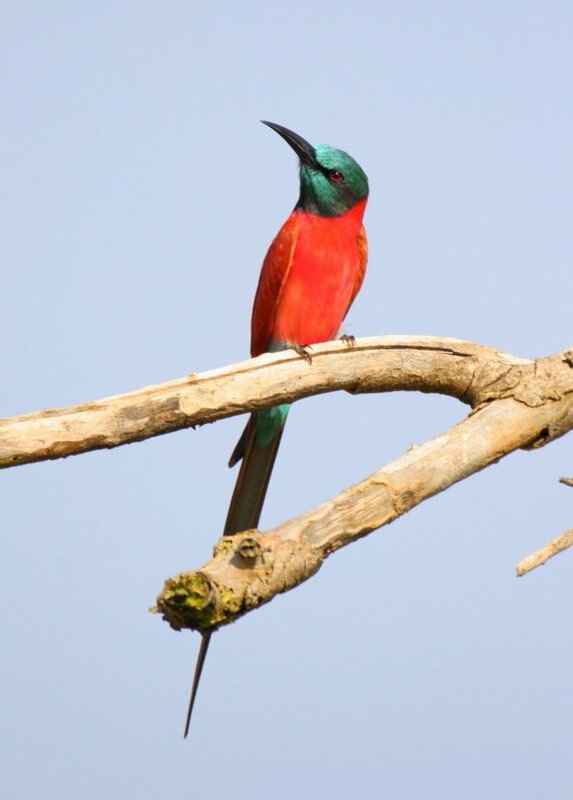 Another species that could well contest the title of Africa’s most beautiful bee-eater, this stunner is more easily found than the previous two species as it has a wider range across Africa’s rainforest zone, is generally more common and also sits out more prominently on forest edge perches. From these high vantage points, they swoop out to catch passing butterflies and other invertebrates. Excellent sites for seeing this beauty include Bwindi Impenetrable Gorilla National Park in Uganda and Ghana’s Kakum National Park. We must leave Africa’s primeval rainforests to find this dry savanna species. Usually preferring arid zones, they occur across a large swathe of Subsaharan Africa, from western South Africa across to East Africa and westwards along the Sahel zone (the dry woodlands south of the Sahara) to Senegal. They are usually found in small family groups perched atop bushes or short trees, from whence they sally out to catch their prey. Excellent sites include Namibia’s Etosha National Park and Ethiopia’s Awash National Park. One of Africa’s most common and widespread species, this aptly named beauty is fond of savannas and grasslands, especially where palms are present. They occur throughout Subsaharan Africa but avoid the deserts and rainforests. 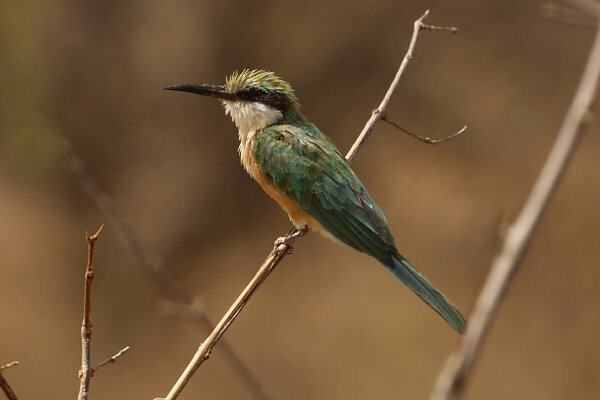 Little Bee-eaters are commonly found in all of Africa’s famous big game parks and have even taken to residing in golf courses, where they nest in holes excavated in the bunkers. Two forms of this bee-eater are known and I consider it quite ridiculous that they are still considered the same species. 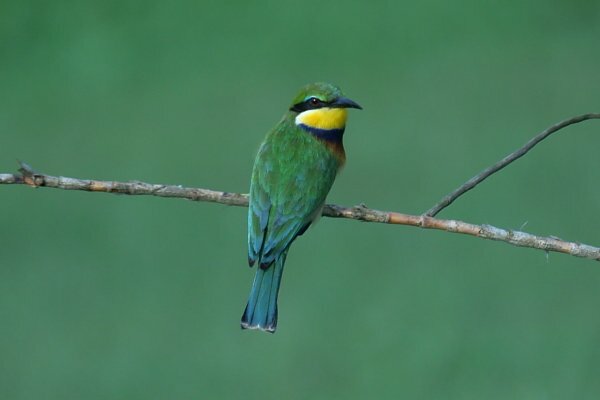 The typical form is a smaller bee-eater with a green forehead that prefers to live in and around swamps and rank grasslands of Central Africa. 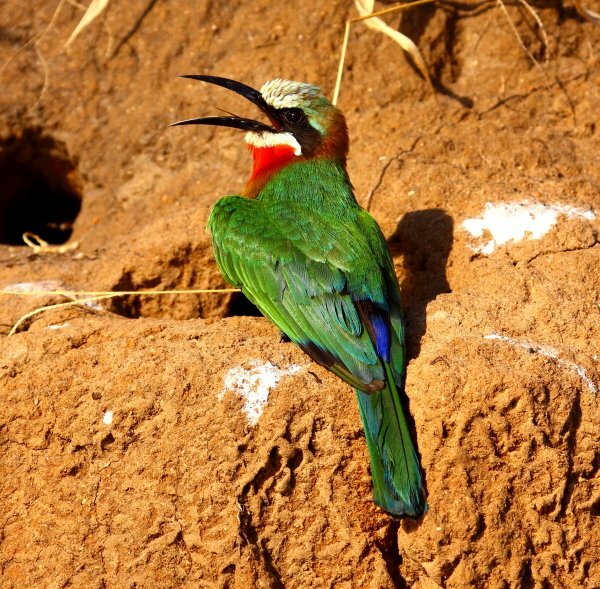 The second form is a larger, more colorful bee-eater with a blue forehead that inhabits forest edges and moist woodlands of the Ethiopian highlands. The former can easily be seen in Uganda’s Queen Elizabeth National Park and the latter on the forested edges of Ethiopia’s Rift Valley lakes. 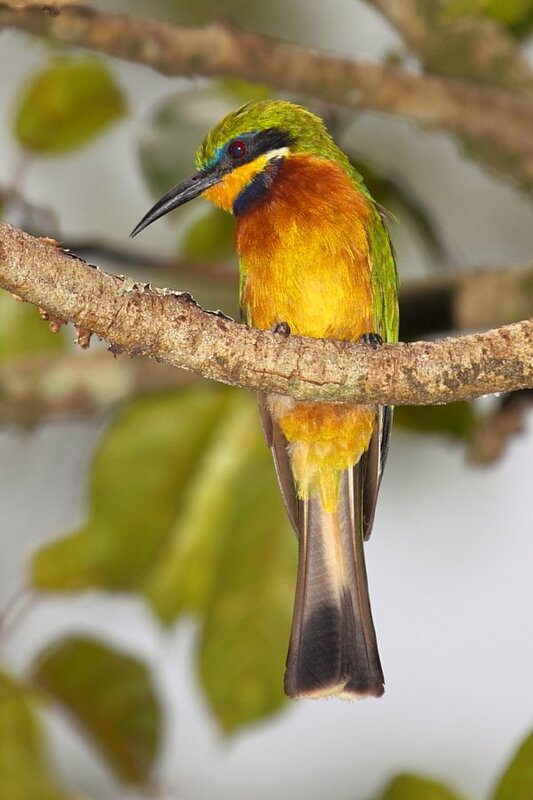 This lovely bird is probably more closely related to the Ethiopian form of Blue-breasted Bee-eater than the Ethiopian bird is related to its sister subspecies. It occurs in similar montane forest edges but further south, with Kenya, Uganda and Tanzania forming the bulk of its range. 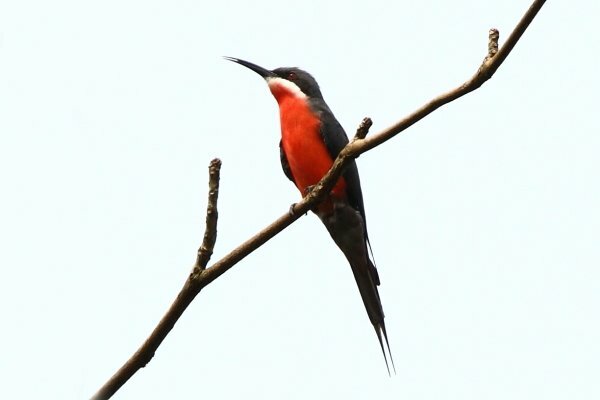 Excellent locations for finding this bird include Uganda’s Bwindi Impenetrable Gorilla National Park and the forests cloaking Tanzania’s Ngorongoro Crater. These sister species forms a north/south assemblage of stunning birds, much in the same way as the Northern & Southern Carmine Bee-eaters. In fact they regularly share nesting colonies with their twinned carmine form (Red-throated with Northern Carmine and White-fronted with Southern Carmine). Both these species are closely allied to the rivers along which they nest and they are not often found far from their chosen watercourses. Excellent sites include Ghana’s Mole National Park and Uganda’s Murchison Falls National park for Red-throated, and Kruger National Park and the Okavango Swamps for White-fronted. 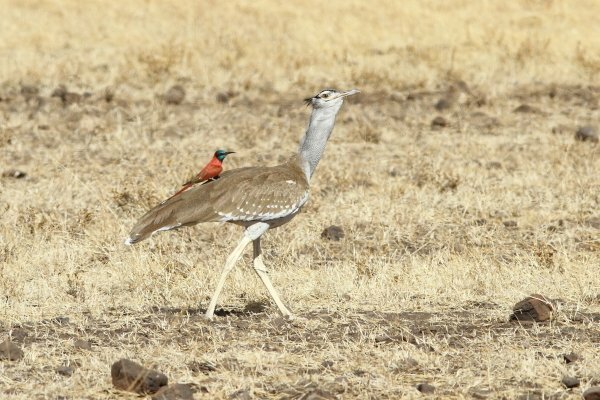 This is the plainest member of its striking family, and is also the one that is often a hole in most birder’s lists as it occurs in rather remote areas of East Africa’s driest savanna. The most accessible site is Samburu/Buffalo Springs in Kenya, but the bulk of its range is in remote and dangerous zones of south-eastern Ethiopia and Somalia. 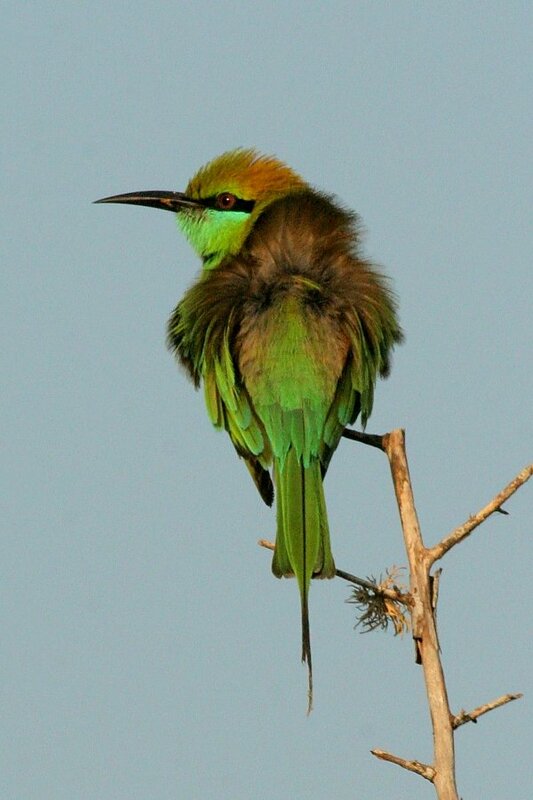 Somali Bee-eater occurs uncommonly within its range, perching inconspicuously on the edge of low bushes in arid savannas. 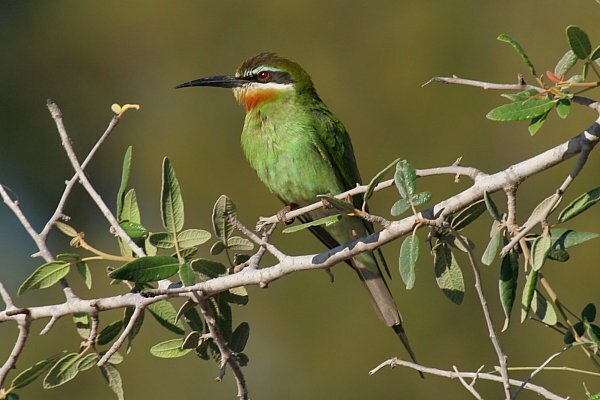 This attractive bee-eater has a rather unusual preference for vastly different habitat zones according to the seasons. White-throated Bee-eaters breed in the driest savanna and arid steppes of the Sahel, just south of the Sahara, yet migrate to Africa’s great rainforests once they have nested. They are also notorious vagrants regularly showing up far out of their normal ranges across Southern Africa and even into the Middle East. They are a twitcher’s nightmare as almost all these out of range sightings are ephemeral, the birds moving off within hours allowing only the initial observer the pleasure of watching them! Good sites for seeing this species includes Ghana’s Kakum National Park and Uganda’s Bwindi Impenetrable Gorilla National Park. 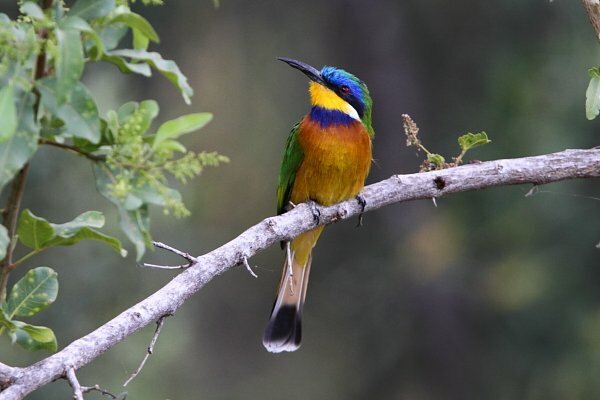 This is another of the more difficult bee-eaters, not because it is rare but rather that its range is restricted to less visited parts of the continent, notably southern Tanzania, Malawi and north-eastern Zambia. It’s a lovely species of moist woodland, and easily found in Tanzania’s Selous Game Reserve and Malawi’s Liwonde National Park. 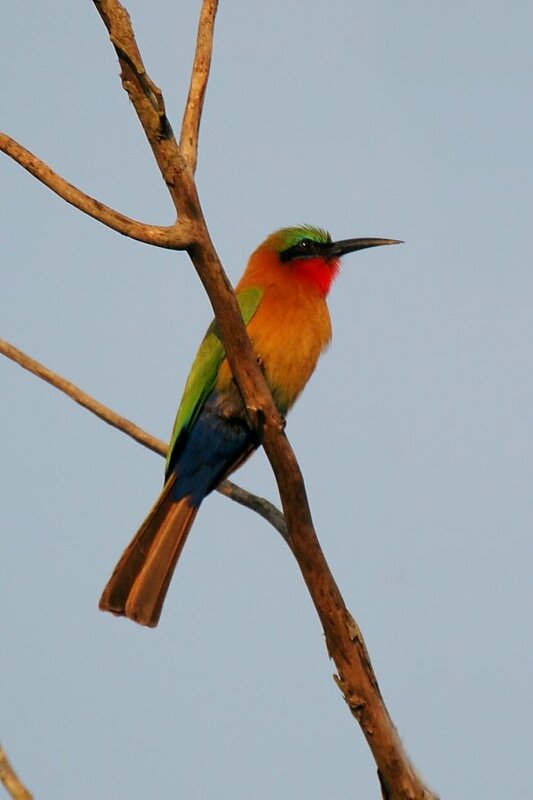 This is one of the world’s most widespread bee-eaters, occurring from Senegal in the west to Vietnam in the east, but with its range restricted to a fairly narrow latitudinal belt across Africa and Asia. 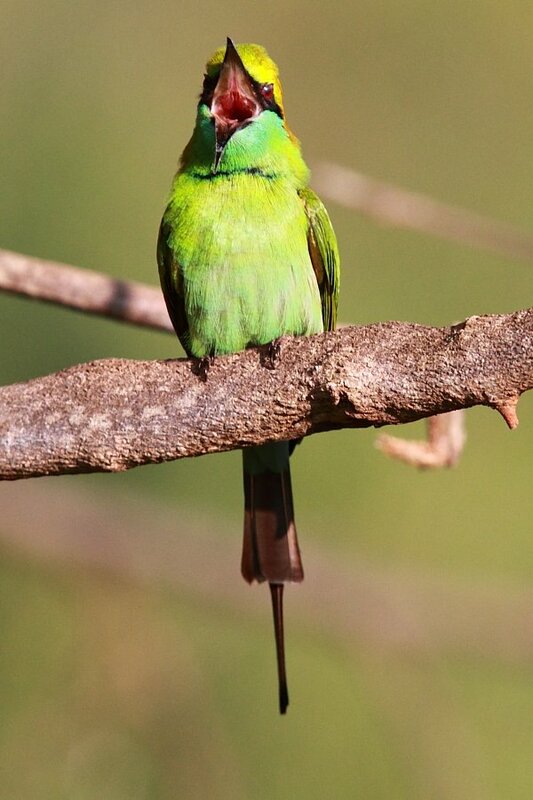 Numerous subspecies exist within this long range, and birds vary from a light green coloration to an off blue. Their preferred habitat is dry woodlands and scrublands. In Africa, they are most easily seen along Egypt’s Nile Valley. This species also boasts a range spanning two continents, Africa and Asia. Two populations exist, the westernmost breeds in the western Sahara (e.g. Morocco and Algeria) and migrates to tropical West Africa. The eastern form breeds as far away as Kazakhstan, through India and the Middle East into Egypt’s Nile Valley, and migrates southwards to East and South Africa. Their preferred breeding habitat is semi-desert, yet they spend their winters foraging in noisy flocks over tropical wetlands. 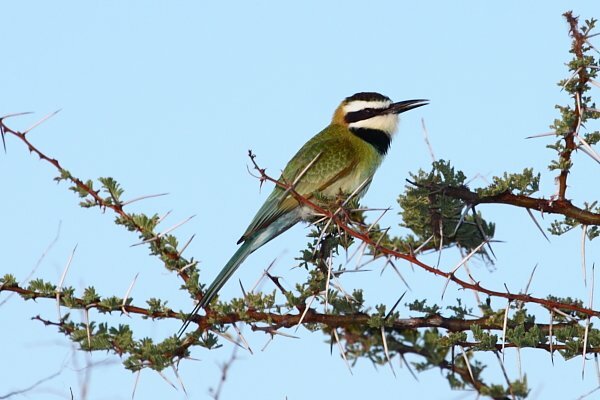 Excellent sites for seeing Blue-cheeked Bee-eaters include the St Lucia Wetlands in South Africa and Murchison Falls in Uganda. Rather similar to Blue-cheeked Bee-eater, this species also has a rather unusual range. Two subspecies exist, the nominate breeds across Madagascar, the Comoros Islands and isolated parts of East Africa, whilst a more range restricted second form breeds in a narrow belt along the Cunene River which forms the border between Angola and Namibia. They prefer open areas, especially around wetlands. Excellent sites include Ampijoroa in Madagascar and Murchison Falls in Uganda. 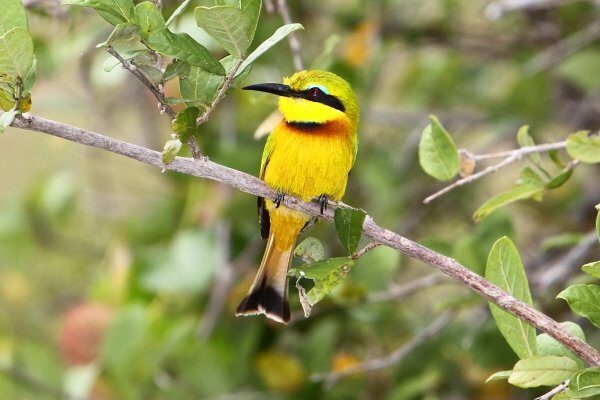 This lovely species, also known as Golden Bee-eater (a name I far prefer) is our 20th and final species of African bee-eater. As its name indicates, it breeds in Europe, with good numbers still nesting on the Iberian Peninsula and into eastern Europe, as well as further westwards right across to China. They also nest in north Africa, and the entire population winters in Africa. Furthermore, some populations have recently started nesting in South Africa and Namibia. This species prefers warm, open countryside and their cheerful calls are often the best indication of the presence. European Bee-eaters can be found through-out Africa at the right time of year. Kruger National Park in South Africa and Murchison Falls National Park in Uganda are particularly good sites. Those are absolutely gorgeous birds and extraordinary images! The roosting family is my favorite. Your post makes me feel like jumping on the next flight to Africa! Congratulations on a memorable post. Fantastic insight into this fantastic family! Thanks for sharing Adam. I adore this family. 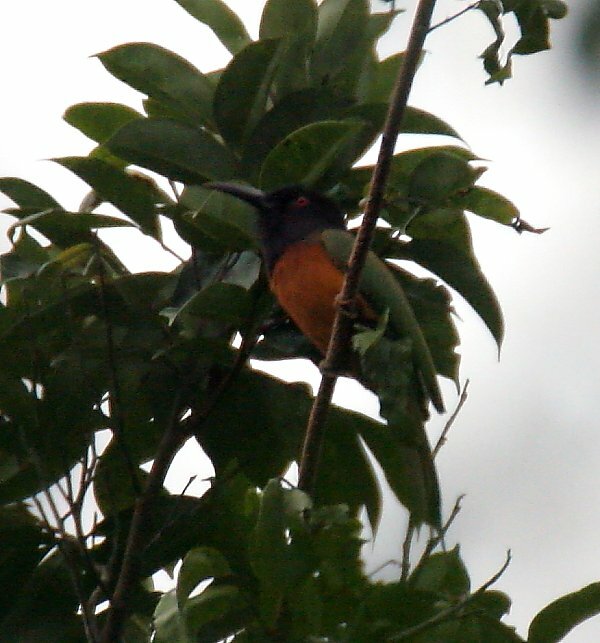 One of the avian highlights of living in Uganda was the Black Bee-eaters I saw above my house. An astonishing bird. Love these birds. And I awarded you a Bean’s Pat as the wondering wanderer’s blog pick of the day. I think my brain just popped. Too! Many! Colors! I’m with Corey. Brain officially popped. Thank you for this great work. Adam is really a very wonderful photographer. Thanks for the great comments everyone, certainly a lot of eye-candy in this post! Seeing a collection of all these birds make me plan for a safari right away.Such creatures make us appreciate the beauty of God.The pictures are so amazing. 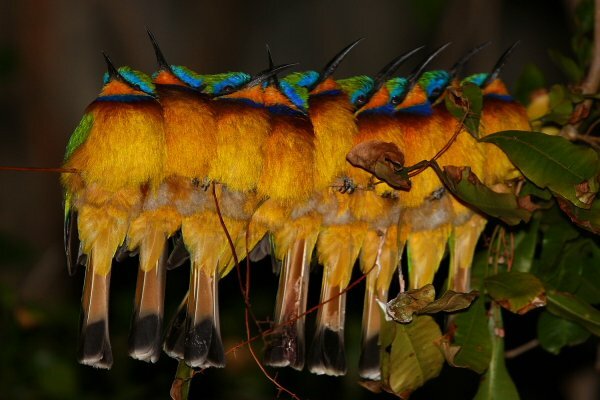 How long are the tunnels that the bee-eaters nest in? Do they actually eat bees as well as other insects? What is the National Bird of Belize?